Are states led by women less prone to conflict than states led by men? We answer this question by examining the effect of female rule on war among European polities over the 15th-20th centuries. We utilize gender of the first born and presence of a female sibling among previous monarchs as instruments for queenly rule. We find that polities led by queens were more likely to engage in war than polities led by kings. Moreover, the tendency of queens to engage as aggressors varied by marital status. Among unmarried monarchs, queens were more likely to be attacked than kings. Among married monarchs, queens were more likely to participate as attackers than kings, and, more likely to fight alongside allies. These results are consistent with an account in which marriages strengthened queenly reigns because married queens were more likely to secure alliances and enlist their spouses to help them rule. Married kings, in contrast, were less inclined to utilize a similar division of labor. These asymmetries, which reflected prevailing gender norms, ultimately enabled queens to pursue more aggressive war policies. One of the features of the Industrial Revolution was the translation of scientific laboratory techniques to viable industrial processes. This is usually regarded as a quintessentially European phenomenon – a product of the Age of Reason, with endeavours based on the results of reproducible scientific experiments and entrepreneurial industrialists. However, investigations have shown that such developments took place elsewhere more than a thousand years previously. Through similar means, the production of zinc by high temperature distillation was turned into a successful industrial process. The location for this birth of chemical industry? Northern India. The production of zinc by conventional smelting methods presents considerable difficulties; instead of a liquid metal forming at the base of the furnace, zinc forms a highly reactive vapour (with a boiling point of 913°C) which exits the top of the furnace and promptly re-oxidises. Clearly, some method of containing and condensing the vapour out of contact with the air was needed – and our ingenious ancestors found a way. There are descriptions of the laboratory preparation of zinc in Indian medical treatises dating from the beginning of the first millennium AD.1 The zinc ore, together with a list of rather exotic organic ingredients, were to be placed in a clay retort set over a collecting vessel filled with water and heated with a charcoal fire. The forming zinc vapour condensed in this process of downward distillation. By the early second millennium AD, these descriptions had become more detailed. The retort was to be shaped like a brinjal, or aubergine, the condenser shaped like a datura, or thorn apple flower, and the zinc ore was shaped into small balls, still using the exotic organic ingredients. The excavations revealed the remains of intact installations dating to the 14th century. But these weren’t for single retort smelting: they were major blocks of seven furnaces, each containing 36 retorts, allowing 252 retorts to fire simultaneously. It is estimated each retort produced about 100–150g of the metal per firing, meaning each furnace block could produce about 25–30kg of zinc per day. 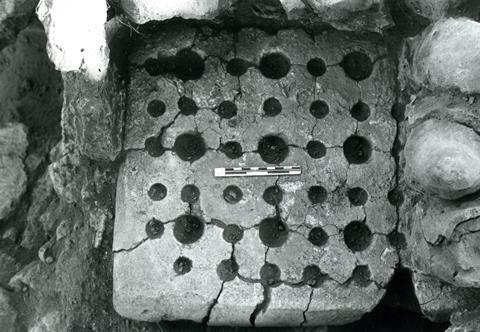 Later, improved furnace blocks were found dating to the 16th century, which contained 108 larger retorts probably produced about 50kg per day. With many such blocks working at once, peak production from the mines must have been several hundred kilograms per day. Traditional processes around the world are often perceived as static, but that was certainly not the case here. 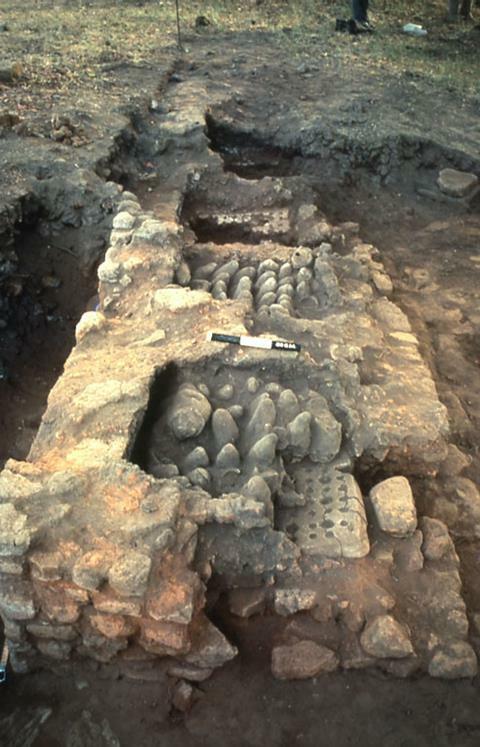 The very first furnaces, dating from about 1000 years ago, had hand-made plates and condensers. In the later furnaces, these were always moulded with exactly the same dimensions and clearly must have been mass-produced in central workshops. While furnaces were still made individually, they had to conform to the precise dimensions of the components – clearly, the authority running the mines was asserting overall control and increasing efficiency. Similarly, the later mines were huge open cast operations that engulfed the earlier works. The mines of Zawar were certainly run by the state, and ultimately the Maharajah. The furnaces were probably run by individual operators, very likely belonging to the Jain sect, whose members, rather analogous to the non-conformist sects in 18th century England, were a merchantile and entrepreneurial class; at Zawar they were responsible for most of the temples. Clearly, the royal government was prepared to finance the development of a very radical process – the first high temperature distillation process anywhere in the world – from laboratory to the mines. The development of a laboratory technique into an industrial process must have had a strong incentive. Northern India lacks significant tin deposits and thus the usual copperalloy was brass rather than bronze. This would have been made by what was known in Europe as the cementation process, in which copper was reacted with zinc ore and charcoal in closed crucible.3 This process (which did not change until the 19th century) was very inefficient and produced a poor quality brass; brass made by mixing copper and zinc metals gave much greater control and a purer product, and thus Zawar zinc would have been prized. Sadly, a high tech process needs stable conditions in which to operate and retain and train highly skilled operatives. While production flourished at Zawar through the medieval period, it faltered following the Mughal invasion and slumped as political conditions in post-medieval India deteriorated. Eventually, the zinc was replaced by imports, initially from China and then from Europe. There’s a certain irony that the first viable European process for zinc, developed by the William Champion of Bristol, UK, and patented in 1742, was almost certainly based on knowledge of the Zawar process; what was long believed to be the first industrialisation of zinc was really selling the metal back to the true pioneers.